Audio Capacitors 5.10uF, ClarityCap ESA250V (Free UK Delivery), Solen & Alcap. 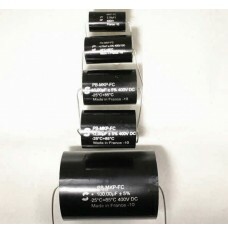 Audio capacitors 5.00uF for loudspeaker crossovers and networks including ClarityCap ESA250V, Solen 400V and 630V SCR FastCap Polypropylene Capacitors, and Alcap 50VDC Standard, 50V Low Loss and 100V Standard Low Loss Electrolytic Capacitor non-polarised series in all values. Falcon Acoustics also stocks a wide variety of makes and types of polyester, polypropylene and polycarbonate capacitors, offering a good selection of operating voltages, tolerances and forms, many of which are OEM types to exactly match original crossovers and networks and are unobtainable elsewhere. Special tolerances can be easily ordered on-line.